Russia and the US have signed a deal to recover highly enriched uranium (HEU) from Soviet-era research reactors. The agreement is aimed at reducing the threat of nuclear materials falling into the hands of terrorists. It covers 24 reactors in the former Soviet Union, Eastern Europe and south-east Asia which, Russia says, contain enough HEU to make 10 nuclear bombs. The deal is part of America's $450m initiative to secure nuclear materials scattered across the world. 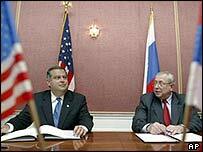 The agreement was signed in Moscow by US Energy Secretary Spencer Abraham and the head of Russia's Atomic Energy Agency, Alexander Rumyantsev. Under the deal, Moscow will remove HEU from each reactor and then transport both the fresh and spent nuclear fuel back to Russia for storage. Washington will foot the bill, estimated at more than $100m. After a signing ceremony, Mr Abraham said the deal showed that "America and Russia were working to reduce the global threat posed by nuclear and radiological materials". The research reactors have long been a concern to the US because of poor maintenance and lax security, the BBC's Steve Rosenberg in Moscow reports. The fear is that they could be an easy target for terrorist groups seeking nuclear materials, our correspondent adds. Weapons-grade HEU or plutonium extracted from spent fuel potentially can be used in nuclear weapons. On Wednesday, at the Vienna-based International Atomic Energy Agency (IAEA), Mr Abraham unveiled America's Global Threat Reduction Initiative aimed at securing nuclear materials around the world. The plan also aims to stop potential terrorists from building a so-called "dirty bomb". 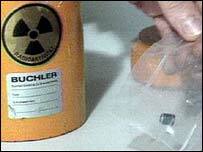 A dirty bomb is a device that uses conventional explosives to spread low-level radioactive material.